The release of Apex Legends Season 1 brought with it the first new character added to the game since its surprise release in January – Octane, the death-defying adrenaline junkie. However, Octane will not be the only Legend added during the Wild Frontier season – as Sony has let slip that a second Legend will launch sometime in the next 12 weeks. While developer Respawn always promised that more Legends would be added during the game’s seasons, there’s never been any official announcement about how many new characters we could expect to land. Thanks to Sony, we now know specifcally that “two new characters will launch over the course of the season”, including Octane. So who is this second Legend? 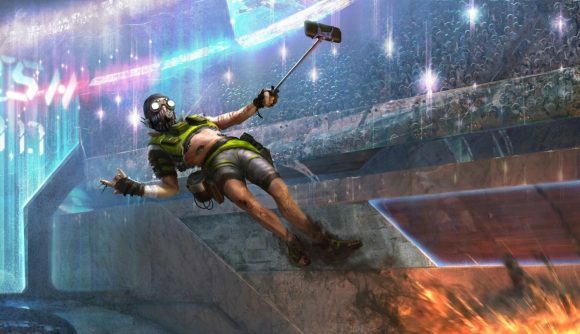 While dataminers had previously dug up ten potential new characters coming to Apex Legends, if we had to put money down, the most likely to make an appearance this season is Wattson – who, like Octane, has had the most detail leaked about her so far. We even potentially know one of her abilities – a Tesla Trap, which goes with the character’s electricity-based theme. The confirmation of the second Legend coming to Apex Legends in Season 1 popped up on the official Sony PlayStation website’s page for the game (thanks, Apex Legends Insider). Scroll down a bit to the picture of Octane and the details about Season 1: Wild Frontier, and it specifically describes “two new characters” – so there’s still one more Legend to drop somewhere between now and the end of the season, which will be around June time. It also says that there’ll be a new weapon coming to the game before the season’s up too. New firearms were also mentioned in the game’s Roadmap, but that didn’t really go into any detail. Sony also notes that “each new Legend and weapon will launch with a full set of cosmetics to unlock”, probably as part of the slightly-disappointing Battle Pass. There’s no word yet about at what point exactly during Season 1: Wild Frontier this new Legend will appear in the game, or whether or not it’ll indeed be Wattson. In the meantime, you better get to used to playing Octane for at least a few weeks – at least until Respawn tells us more.